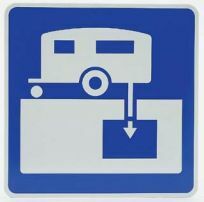 Public dump points offer a place for caravanners to dispose of grey and black water, as well as sewage waste. Visiting a dump point is the most environmentally friendly method of emptying waste from a caravan. There are also certain rules and etiquettes governing the use of public dump points and waste disposal sites. If you do not have access to such a point or toilet waste disposal facility then you can bury the waste completely and at least 100 metres from a water body and 1 km away from camp sites, national parks, reserves or populated places. Most dump points will also provide a hose for rinsing holding tanks. Unless stated otherwise, be careful not to use this hose to refill fresh water tanks, as the hose may not contain clean (potable) drinking water.